Great Moose Adventures and Becki Dickey are proud to offer quality ‘kid’s yoga’ in an engaging and meaningful way ! As a certified 'Rainbow Kids' yoga instructor, Becki provides children with the opportunity to enjoy the benefits of yoga movements through games, stories , songs, team building, exciting props and circle time activities. Using these engaging techniques, 'Rainbow Kids' yoga encourages the students to combine movement, balance, and breathing techniques to explore animals, plants, different cultures, literature, music, art and so much more. 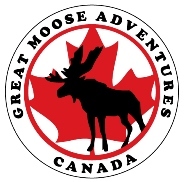 As a result, kid`s yoga at Great Moose Adventures is educational and entertaining. In addition, due to the structure provided by 'Rainbow Kids' yoga, classes can accommodate a wide variety of students in terms of age, numbers and physical fitness. More importantly, Becki is able to control the tempo of her class between high energy and quiet reflection, while meeting the needs of every student.